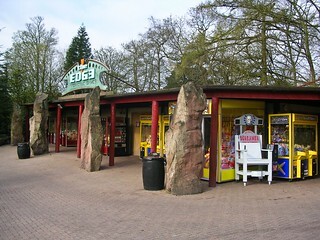 The Edge Interactive Games can be found at the entrance to Forbbiden Valley and was first added to the park as part of the development of Thunder Valley way back in 1992. This gives the arcade the honour of being the longest continually serving attraction in the area, not bad for what is essentially a reclaimed mobile office unit. Games have come and gone over the years but the arcade by and large retains it's original look, though the distinctive blade signs were added in 2002 as part of the Dynamo expnasion of the area. More recently the arcade became the haunt of choice of guests who were perhaps a little too timid for Sub-Terra.